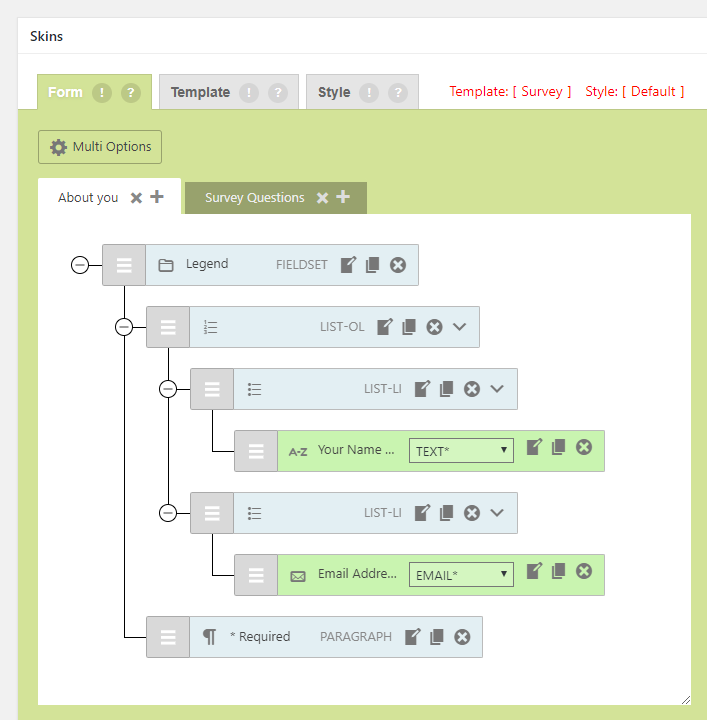 Now you can build multi-part forms quickly and easily, right within the Contact Form 7 interface. 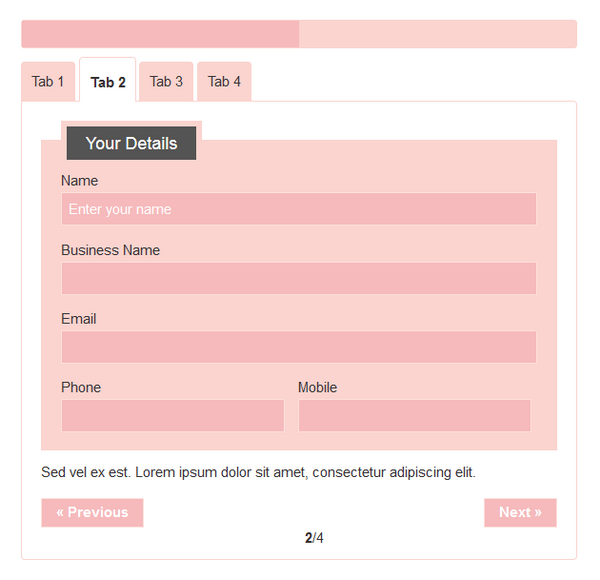 Multiple page forms are the modern way of handling extensive forms. Generally users are much more comfortable in filling forms section by section, instead of going through long forms. The Contact Form 7 plugin does not offer this functionality. CF7 Skins Multi allows you to easily break your Contact Form 7 forms into multiple steps. Forms can be divided where required, quickly & easily, right within the Contact Form 7 plugin interface. CF7 Skins Multi includes the features you need to make user friendly multi-part Contact Form 7 forms. You can choose how you want each multi-part form to operate by simply selecting from the range of options. Break up your Contact Form 7 forms into as many multiple parts as you need. 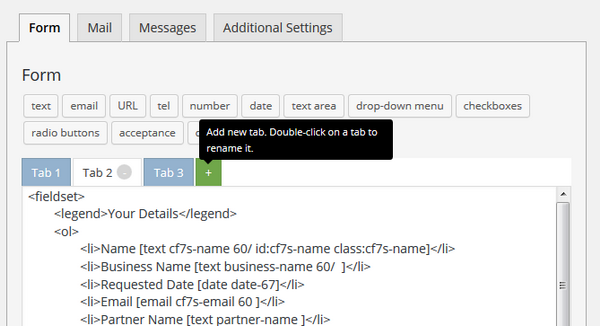 You can use the CF7 Skins Visual Editor to easily add multiple parts to your Contact Form 7 forms. 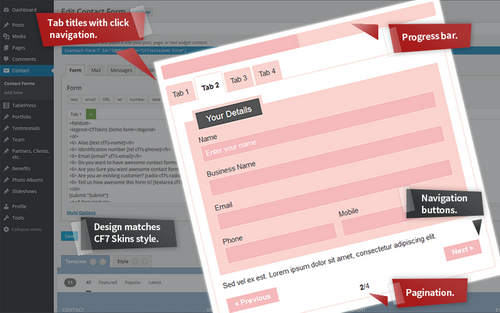 You can also use the traditional CF7 form editor to add or edit your multiple page forms. The styling of the CF7 Skins Multi elements in your form matches closely with your selected CF7 Skins Style. In addition if you complete the CF7 Skins Multi Demo Form we’ll send you a Discount Code to use with your purchase. You can help us improve CF7 Skins Multi by completing this form. This will show you a CF7 Skins Multi form in action. In addition, as a thank-you, we’ll send you a Discount Code to use with your next purchase from CF7 Skins. In addition, as a thank-you, we'll send you a Discount Code to use with your next purchase from CF7 Skins. Generally, users are much more comfortable in filling forms section by section instead of going through long forms. With CF7 Skins Multi you can break up your forms into separate parts/tabs/sections as you want. How would you describe your WordPress skills? We're interested to find out which of the features included with CF7 Skins Multi are most important to you. How important are each of the following features in CF7 Skins Multi to you? Is there another feature you would like to see added? If you have any suggestions to improve CF7 Skins Multi please add them below. Sign me up to receive regular emails about how to use both CF7 Skins and the Contact Form 7 plugin more effectively. See our in-depth documentation for a detailed explanation on how to use CF7 Skins Multi. It’s a great place to find detailed answers that covers how to get started, how to customize your forms with CF7 Skins and everything else in between.